Are you waiting for Windows 8.1, codenamed “Blue,” and the return of the Start Menu? You are going to need to hold your breath a bit longer than originally thought. Nevertheless, Microsoft remains roughly on track to deliver a major update by the one-year anniversary of the Windows 8 release — hurray? Long-time Microsoft watcher Mary Jo Foley writes that Windows 8.1 is being delayed with both user updates and OEM release pushed out until mid-October. Further, Microsoft won’t be pushing Windows 8.1 betas to its Microsoft Developer Network (MSDN) and TechNet subscribers — that was supposed to happen by the end of the month. 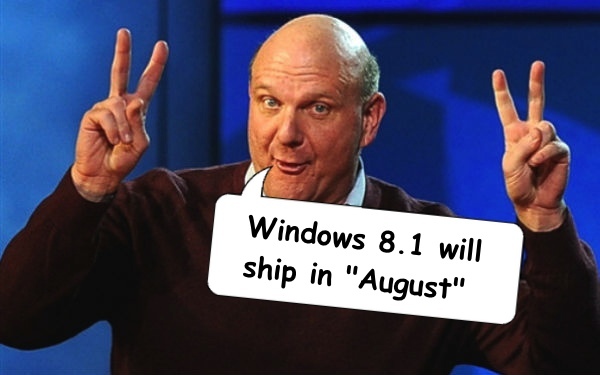 Bad news out of the way, Redmond still plans to push Windows 8.1 RTM (release to manufacturing) pre-release code to OEMs by the end of August, which gives partners four to six weeks to test and deliver Windows Blue boxen in time for the Christmas buying season.